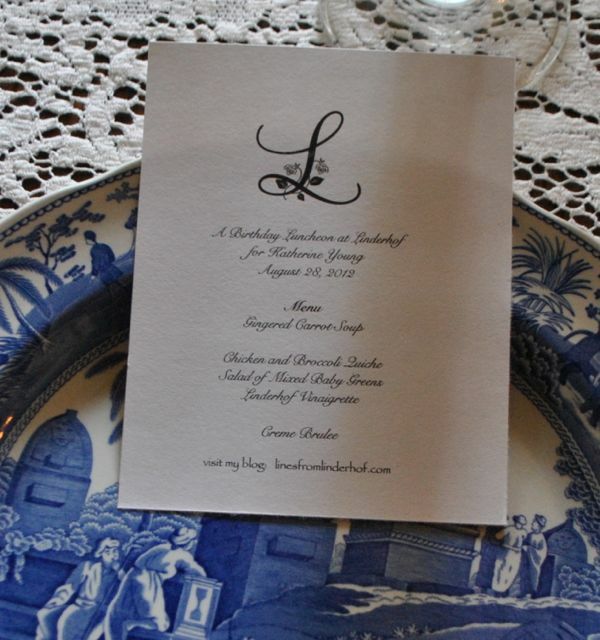 I love linens and lace. I have a couple of my grandmother's damask tablecloths and napkins and I have a beautiful lace cloth of Husband Jim's mother's. These were the start of my "collection". 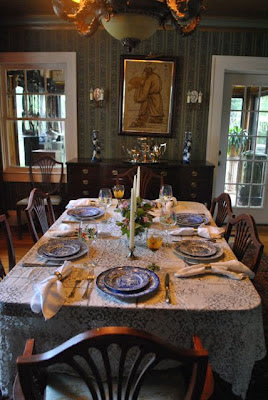 Sunday dinners were always taken in the dining room. 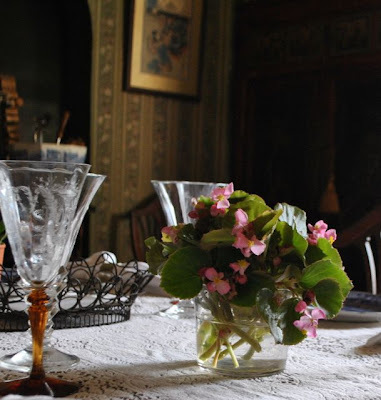 The table was always covered with either a damask or a lace tablecloth. Real napkins (which were used for every meal) were at every place. 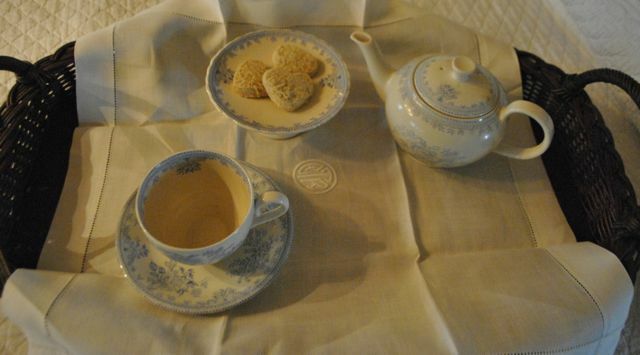 Estate Sales are a wonderful resource for old linens. Years ago they were mere pennies. Today, they're a bit pricier and often more than my meager purse will allow. But with bulging linen drawers, there is really no need for additional linens. 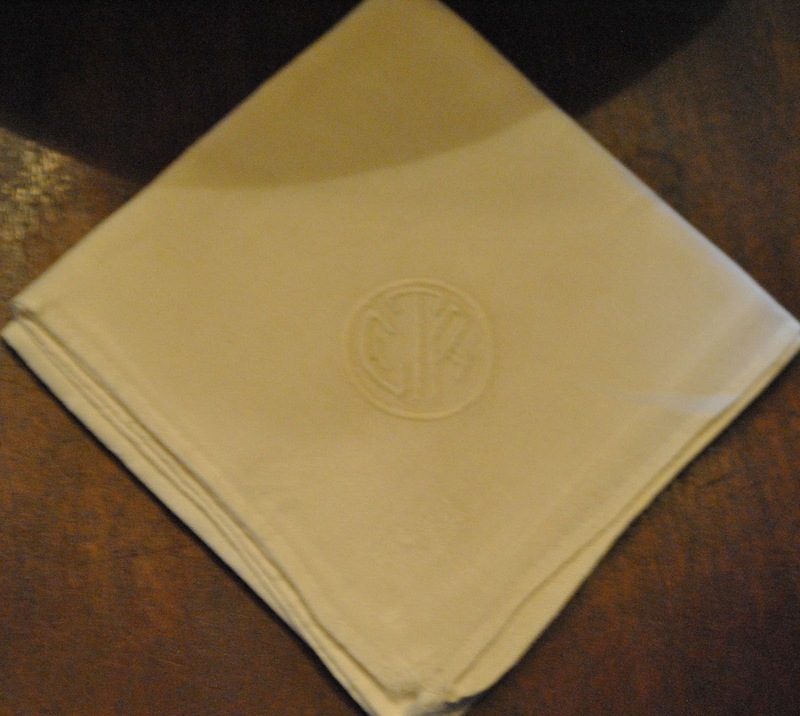 We can have a houseful and offer a linen napkin to each guest! But at each estate sale, I am always drawn to the "linen room"
A few weeks ago, we went to an Estate Sale -- it was the second day and so everything under $100 was half price . . .
And the "linen room", I found . 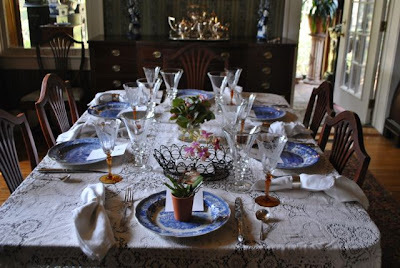 . .
A tray cloth -- mother always insisted that a cloth be placed on a tray before use. 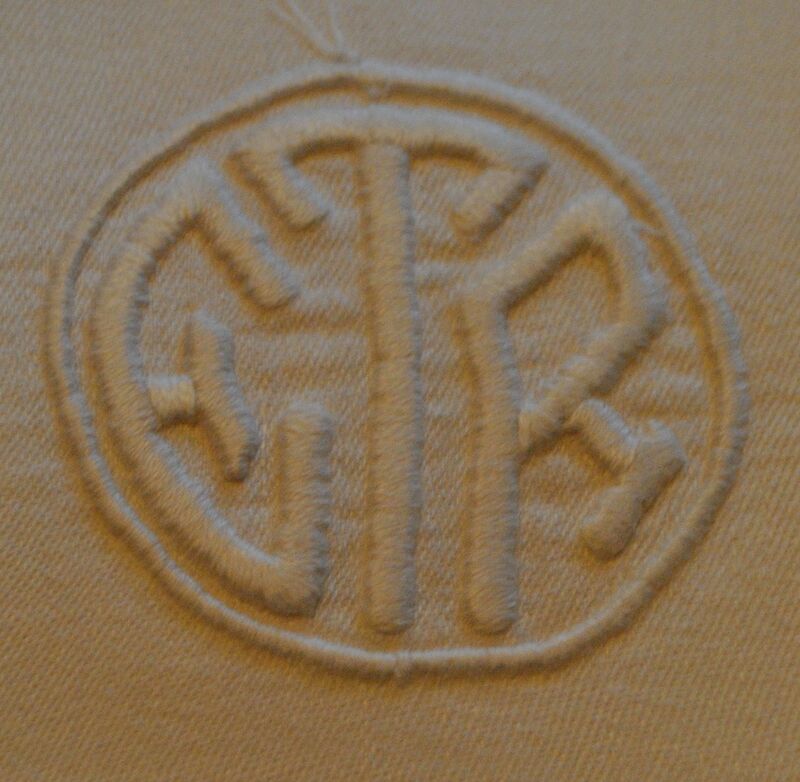 A very fine linen tray cloth with a monogram. A loner -- a single! 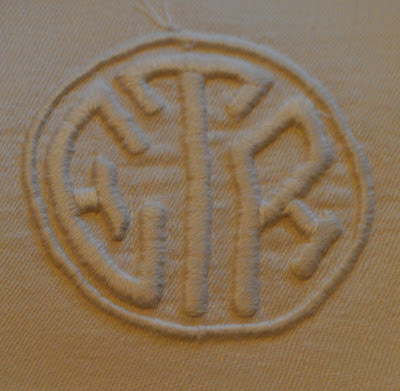 One damask napkin with the same monogram in the corner. True treasure -- a big pile of damask napkins! 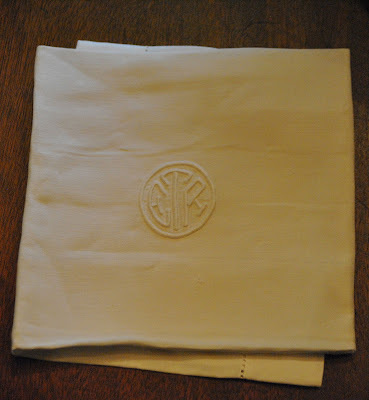 And a pile of napkins -- all monogrammed. 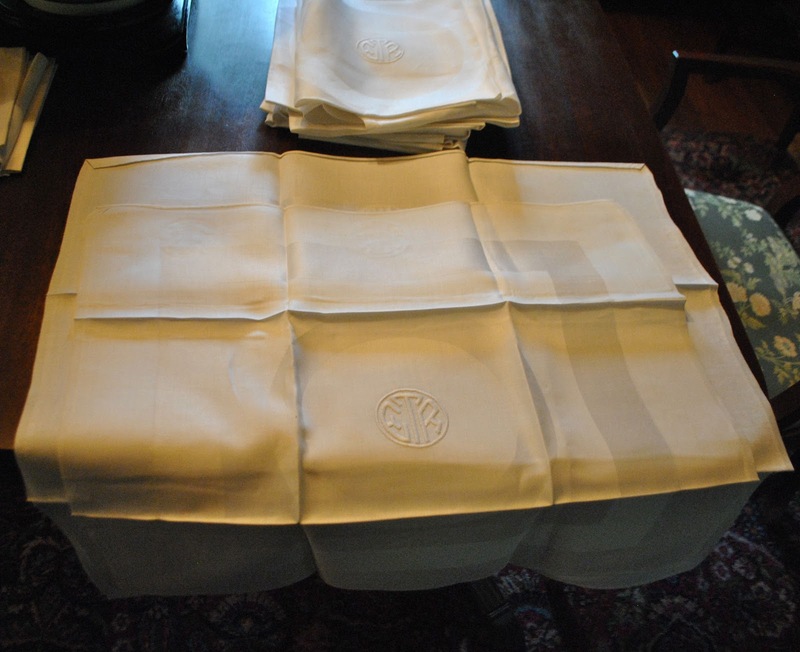 Fine napkins come in three sizes -- small breakfast ones, medium size luncheon ones and extra large dinner ones. There were seven of the luncheon napkins and 12 of the dinner ones! And I don't have any napkins as large as these -- they'll be great the next time we have company for dinner. Are they wedding linens where Miss "T" (Emma Rose) filled her linen cupboard with finely embroidered damask napkins in preparation of her marriage? 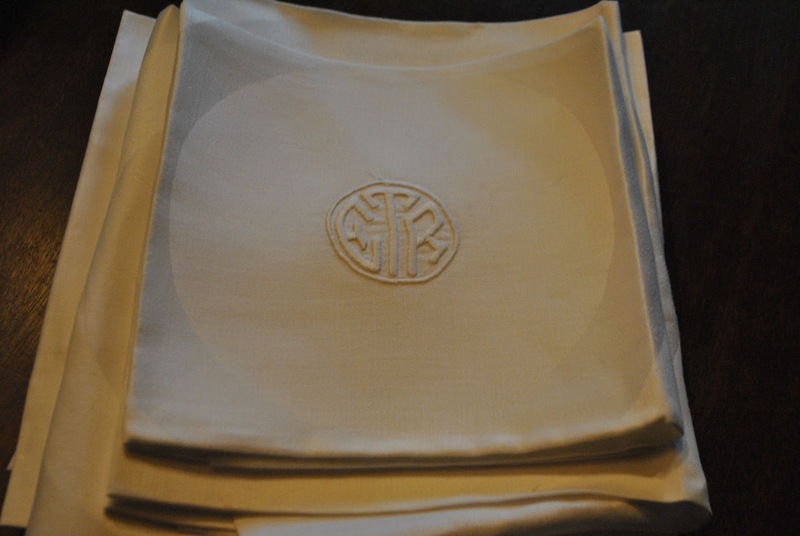 Are they napkins that the "T's"(Edgar and Ruth) bought later in their marriage, after college and perhaps law school and embarking upon a successful career felt the need to entertain and so ordered linens so that they could? I'll never know but I simply adore the "T's" napkins! And the price? For all of them? $5!!! 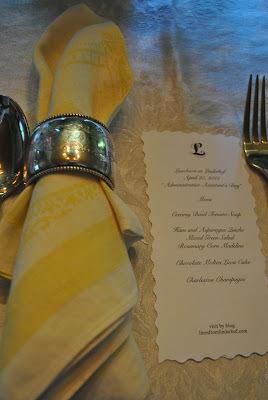 Always a linen napkin in a silver napkin ring. Whether it is just us or we have company. When it is just us, we'll use the the napkin for several meals. For company, they get used just once. 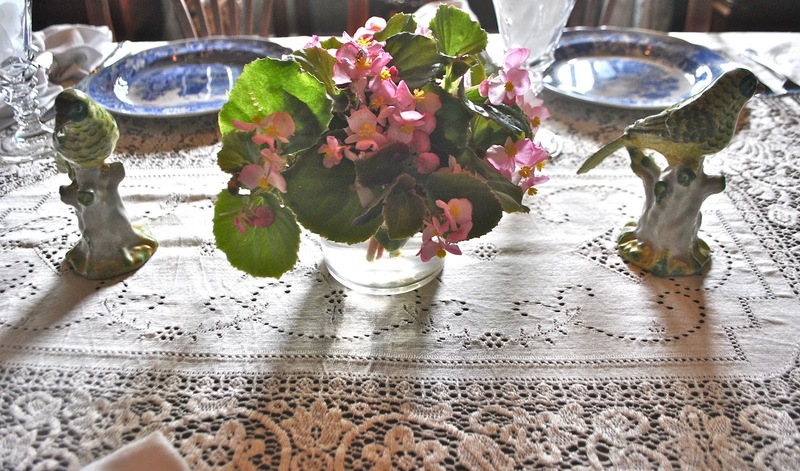 A lace tablecloth perfect for company. 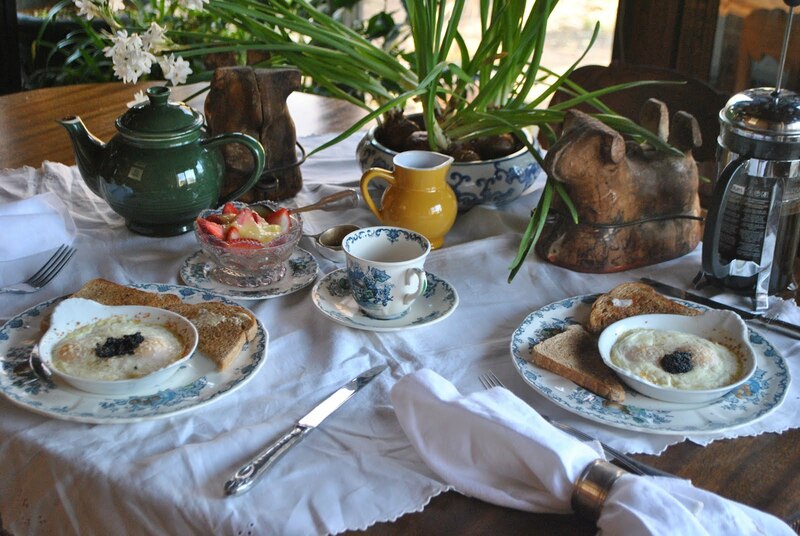 A "bridge" cloth is a perfect tablecloth for breakfast for the two of us. Whether it is . . . I use lace more because it requires less ironing! Lace is good for a casual breakfast as well. Friend Katherine has been a friend for a long time. From when we lived in the little town 20 miles east of us. And our friendship has continued. It's always great to see Katherine whether here or there. When Friend Barbara called and said she wanted to celebrate Katherine's birthday at Linderhof, of course, I said yes. And so this week, they came . . . Katherine and five friends. Dining Room table all ready for company. A ladies luncheon. 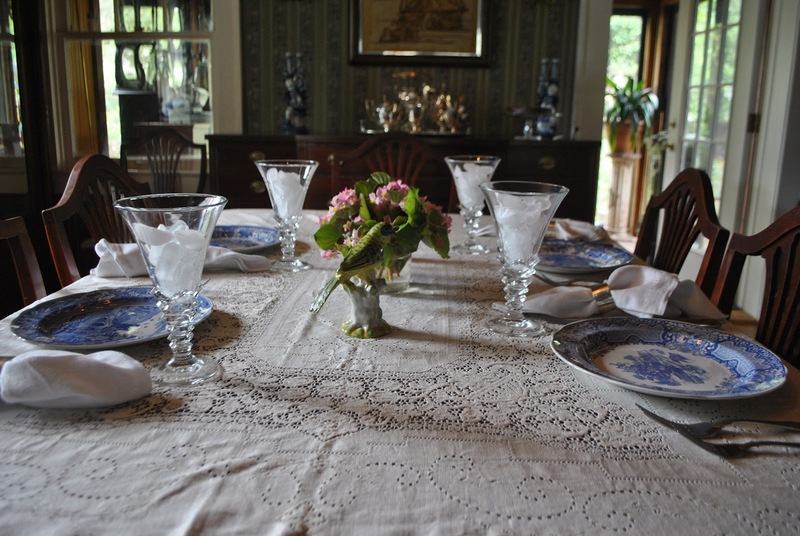 Lace tablecloth, damask napkins (in the silver napkin rings), fresh flowers on the table. A present for Katherine, an orchid lover. Katherine's place. A basket for cards and a week orchid -- a gift from me. I always love that time just before guests arrive. The dining room. All set and waiting to celebrate a friend's birthday. 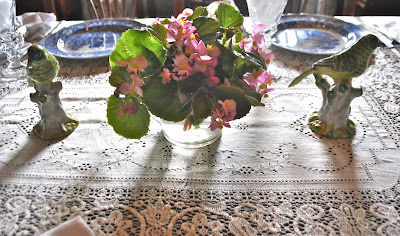 Flowers in the garden have been sparse this hot and dry summer but the begonias bloom on. I've been cutting them for the table . . . a bouquet in one of the wine rinsers. Short flowers because we believe that a centerpiece should add a bit of freshness and color -- not be so big that you have to talk around it! Aways a menu -- one per person. To take home, if they wish (and they usually wish). A memento of the day and the meal and the celebration. And the food . 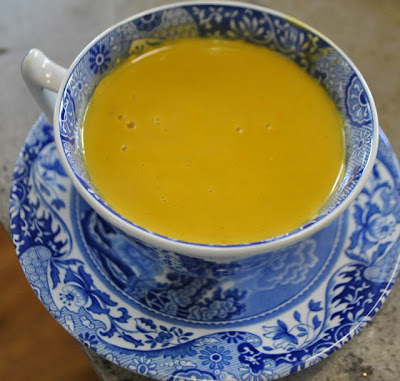 . .
A simple soup with the flavor of carrot and ginger. Gingered carrot soup which looks a little bare for the candied ginger garnish sunk to the bottom! A crustless quiche so you can have pie for dessert. 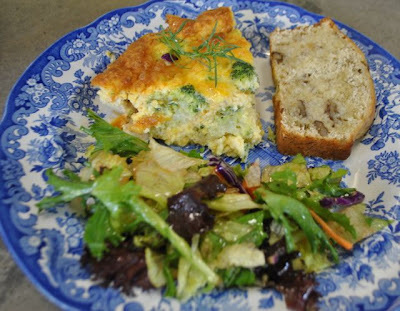 My favorite quiche recipe -- the bare bones are good and the "ingredients" are easily changed. This time I made a broccoli chicken. Served with slices of toasted buttered banana bread and a green salad with Skyview Farms Chèvre. And the dessert -- Katherine's favorite . 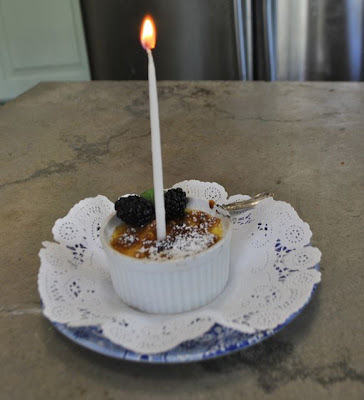 . .
Creme brûlée. Done European style in ramekins rather than those shallow dishes that most restaurants seem to use now. And Katherine's . . .
Just one candle. A lady shouldn't tell her age! Had a candle. We all sang "Happy Birthday", she made a wish and blew out her candle. It was a fun afternoon and I was pleased to be able to celebrate Katherine's birthday with her. "We want to party too!" 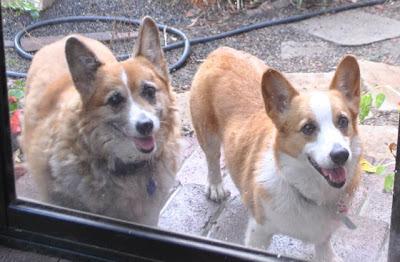 The corgis were not happy that the party was inside and they were outside! For custard: Preheat oven to 300. In a saucepan, combine the cream, vanilla and salt. Warm over medium heat until the surface begins to shimmer, about 3 minutes. Remove from heat. In a large bowl, stir the egg yolks and sugar with a wooden spoon until blended. Pour into the hot cream mixture and stir gently to avoid forming air bubbles. Strain the custard through a fine mesh sieve into a pitcher (or large mixing cup). Skim off surface bubbles if any. 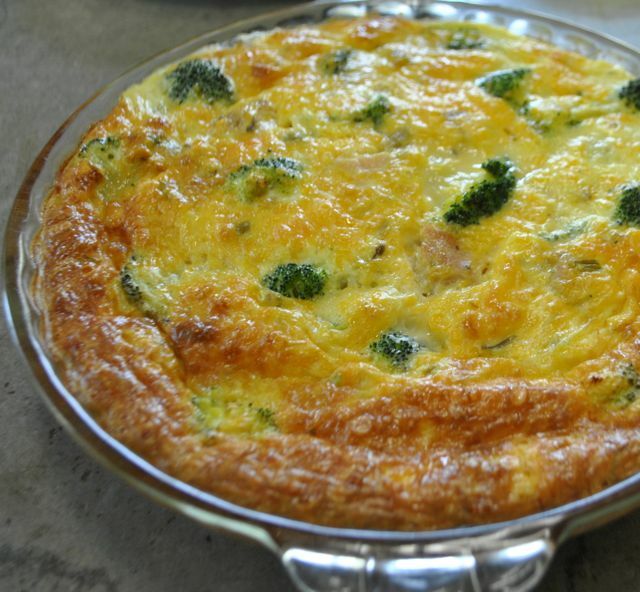 Place ramekins in a baking dish with 1 1/2 to 2 inch sides. Pour custard into the ramekins, filling them to the rim. Pour in enough very hot water to reach halfway up the sides of the ramekins. Cover barely with foil and bake for 1 hour 40 minutes, or until the custard is firm around the edges. (it may still be wobbly in the center but it will firm up as it chills). Cool for 15 minutes. Then remove custards from the water bath. Let cool to lukewarm. Cover and refrigerate until cold, at least 1 hour (the custards can be prepared to this point up to 2 days ahead). If small pools of liquid develop on the surfaces, blot with a paper towel before proceeding. Preheat broiler to 500. Set the ramekins on a baking sheet. Sprinkle a very thin layer of brown sugar over the chilled custard, about 1 T. patting it evenly. Broil the custards as close to the heat as possible until the sugar is caramelized, about 1 minute. (It will be melted and deep brown in color) watch carefully that it does not blacken.) Let custards cool to room temperature, then chill for 45 minutes or up to 3 hours. Serve the same day once the topping is caramelized so that the topping is crisp. The topping will soften if chilled overnight. 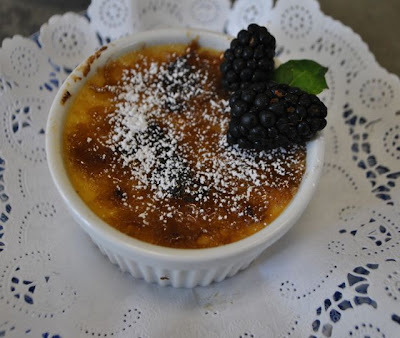 NOTE: This recipe is from friend Michael Richardson's cookbook, The Best of Cottey Cooking and is a classic creme brûlée. It's Thursday and I'm sharing my Birthday Luncheon with Susan at Between Naps on the Porch for Tablescape Thursday. Anyone who attends church on a regular basis also has participated in a "pot luck". The typical after church meal served in the fellowship hall where ever member brings a dish for the communal food table. And for those who collect cookbooks, there are even whole cookbooks on the subject in case you're a "pot luck" newbie and can't remember what your mother always brought to church! The Pot Luck table is laden with food -- there are always old favorites like cheesy potato casserole and green bean casserole and always a platter or two of fried chicken (although now it's more likely to come from KFC rather than home) but pot lucks also showcase what is new. A pot luck was the first time I tasted that broccoli/raisin/sunflower salad (now a classic pot luck food) and the classic pasta salad (not the macaroni salad I grew up with but pasta and vegetables in an Italian type dressing). And, of course, here on the prairie, jello salads are always a part of a pot luck. Your choice of pink or green or red! And whoever brings deviled eggs always brings home an empty dish! Then there is the dessert table. Desserts are too serious to put with the regular food. They need a table of their own. At my old church, St. Paul's, Mrs. Sitz Lemon Meringue Pie was the favorite dessert. Cut into 8 pieces, you almost had to be no more than eighth in line to score a piece! Alas, at our current church, there is no Mrs. Sitz and her Lemon Meringue Pie. In fact, rarely is their a lemon meringue pie as one of the offerings. But we don't lack desserts. Oh, no. Chocolate cake, cobblers with fruit in season, and homemade cookies are almost always some of the dessert offerings. And it's hard to just take one -- so you see little half pieces of the pies and cakes in the pans for most want to try some of everything! To go along with the desserts, the big 100 cup coffee maker is always filled for we mostly German Lutherans have to have our coffee! Both with the meal and with dessert! The Pot Luck is the women's domaine although the men set up the food tables. (We women would not do physical labor at church1) We put on tablecloths and put out the food making sure that there is a spoon (or fork) in every dish. Plates, cutlery and napkins are put out at the head of the table and the Pot Luck always follows the meat, casserole, salad set up. At our church, we always start with prayer and often we sing "Be Present At Our Table Lord" before we attack the food table. Sunday, our church had our annual End of Summer Pot Luck. 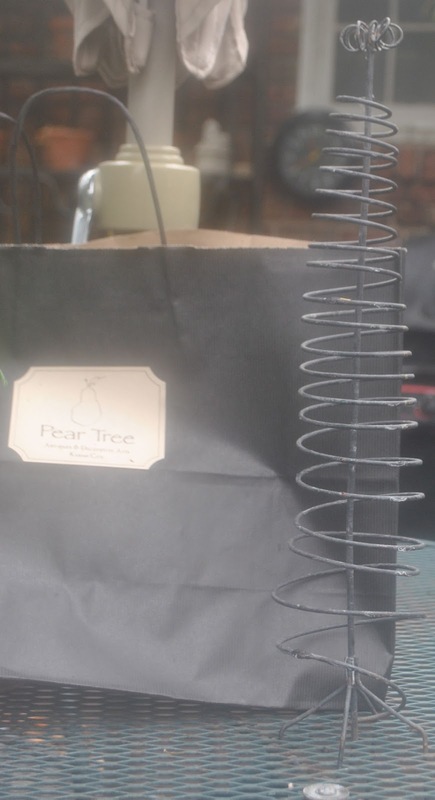 I never bring anything "tried and true" preferring instead to search cookbooks for something new to try. 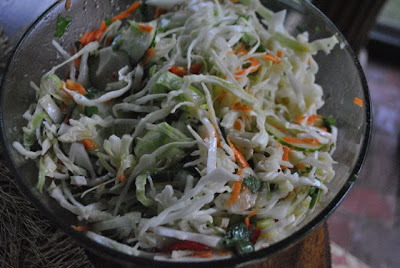 I found this wonderful recipe for a Thai Salad -- although salad, is really a misnomer for it's really a coleslaw. It's good and I did "tame" it down a bit by not adding the jalapeños. Children, I felt, would not find them "friendly". Even though there were other coleslaws offered, I brought home only enough for our dinner Sunday night. It's a keeper of a recipe and does have Thai flavors. And I will make it again. For other buffet dinners for next time we have a church pot luck, I'm sure that I'll try a new recipe again! In a large bowl, combine the cabbage, cucumber, carrot, peanuts, green onions and jalapenos. In a separate bowl, combine all dressing ingredients and whisk until well mixed. Pour the dressing over the vegetables and toss. NOTE: Because there were kids at church I did not use the jalapenos -- but when we had it for dinner I did add some chopped sweet picked "sweet heat" jalapenos. Sunday was a rainy day on the prairie. We've not seen many rainy days this summer. Beginning in June, moisture has been practically non-existent this summer except, perhaps, for a 10 minute downpour. And that only two or three times. Sunday (and Saturday) rain came. Not a 10 minute thunderstorm but a nice drizzly afternoon of rain. 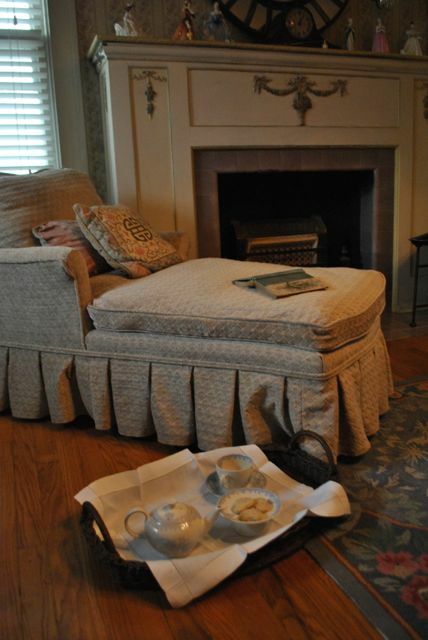 Alas, not being able to work in the garden, I decided to take a tray to the Master Bedroom and relax with a book. 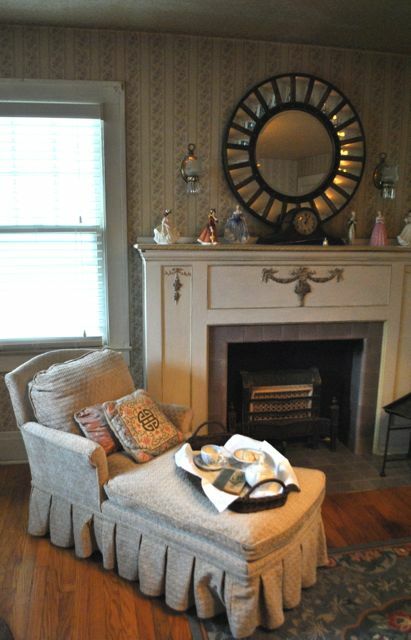 The chaise in the master bedroom. The chaise -- bought just for such afternoons. A perfect place to stretch out, have a cup of tea and read a book! Two pillows -- one is from the original fabric on the chaise. A reminder of what was. But we like the beige velvet much better! The tea tray -- with pot and cup and saucer and a compote of cookies and a book, a favorite -- rainy days call for favorite books -- Elizabeth and Her German Garden. Cookies on the floor can sometimes be corgi fodder. Alas to read, the tea tray goes on the floor. And if there are any cookies . . . . the corgis believe that food on the floor belongs to corgis! A simple tray for one! 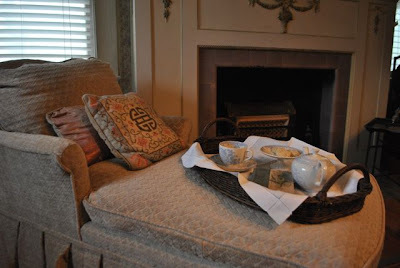 It is Tuesday -- and Rainy Days and Sundays is being shared with Sandi at Rose Chintz Cottage for Tea Time Tuesday! 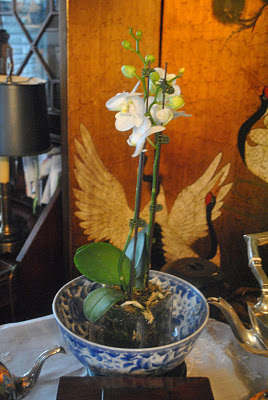 Last fall, I was surprised by a magnificent white orchid. From friend and fellow blogger, Cass from That Old House. I adore orchids and this was a beauty! So as a thank you for the orchid, I invited Cass for tea . 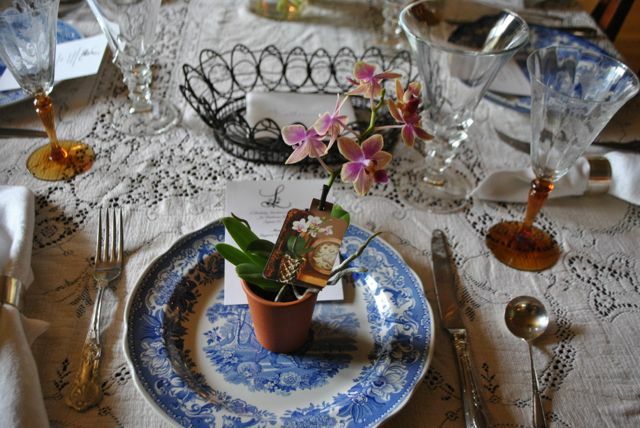 . . with the orchid as a centerpiece! 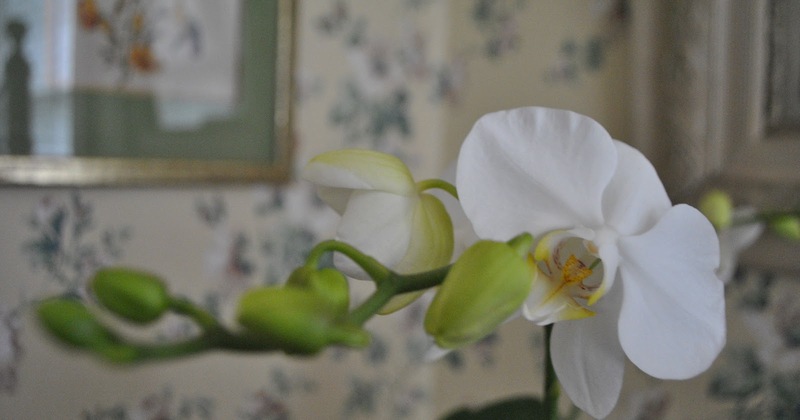 And the orchid lived the rest of the fall and into the winter with the wonderful white blooms. 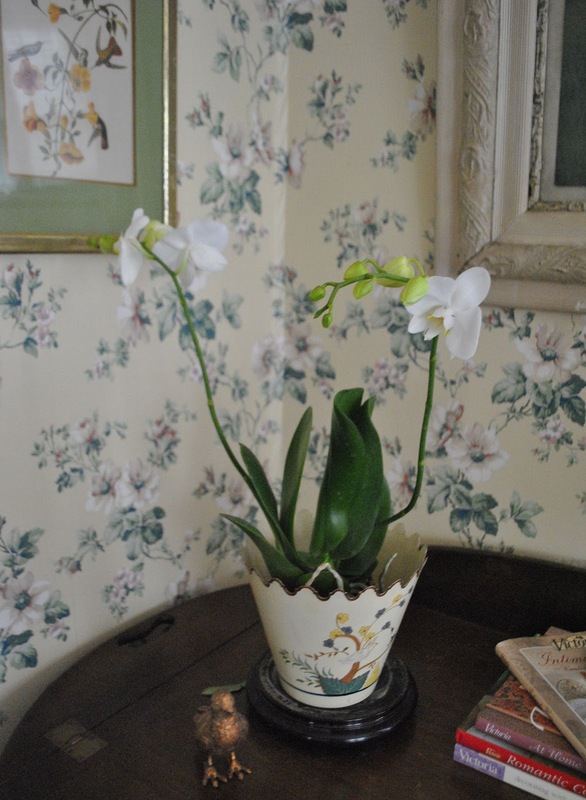 Orchids are long blooming plants which is why I like them so. And taking care of them properly, you can get them to rebloom. 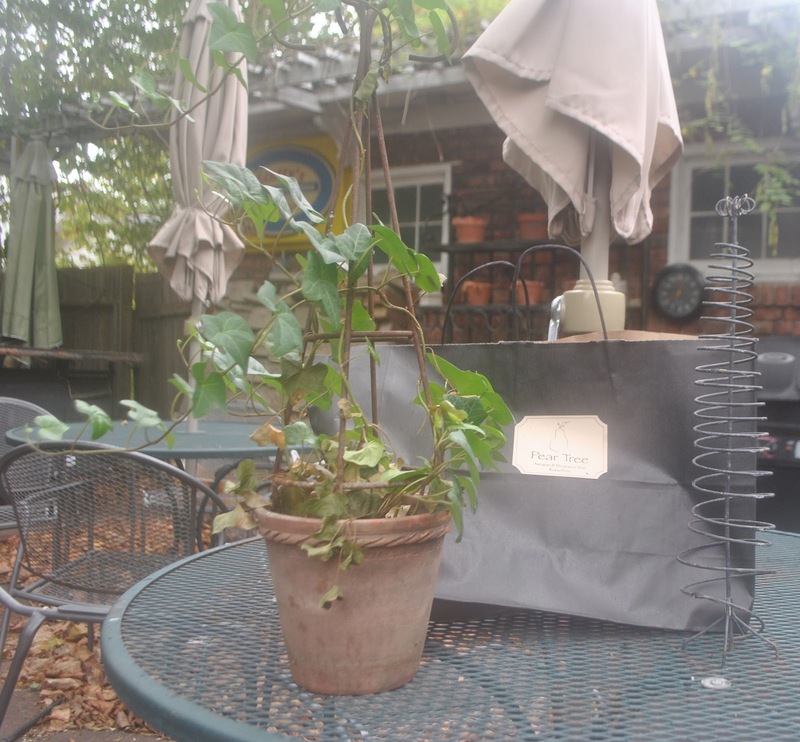 Once the blooms of the "Cass Orchid" fell, I cut back the bloom stem, kept the plant in the proper window and watered and fed. And now in August . . . The "Cass Orchid" is blooming once again. I get so excited when I see the first bloom spike appear and I start in on a feeding regimen. And as the spike grows . . . and then buds appear . . . and soon the first flower. It is pure excitement for an orchid lover. Has a beautiful bloom -- it's so white. 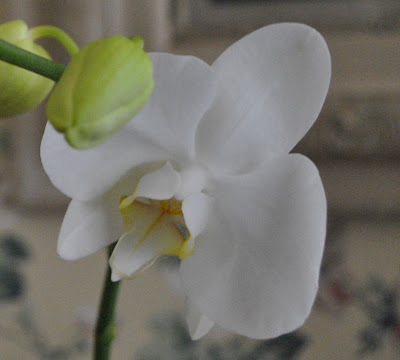 And there are lots of additional buds which means that there should be a long bloom time before the orchid is finished. The rest of summer and a good part of fall. The guest room table is the perfect place for it. It looks good in the tin toleware cachepot bought ages ago from Source Pierre because it looked more expensive than it was. And it's perfect in this corner of the guest room. 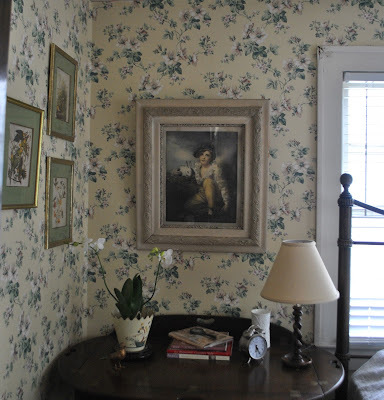 And even though it is in the guest room, I do make sure to stop by each and every day and bask in it's beauty. It's Monday and I'm sharing my reblooming orchid with Susan at Between Naps on the Porch for Met Monday. Tuesday, the Lunch Bunch traveled north for a "Road Trip" which landed us at a great restaurant for lunch and then shopping in a favorite Kansas City area, Crestwood. Alas, I found a treasure . . . It goes up and around and around! A "Wobbler" -- from Pear Tree Antiques. A favorite shop whose inventory is European -- both big and small. In the shop is a sink that I covet . . . I drool every time I visit and I know it would be perfect in Linderhof's garden! But alas, it is a permanent fixture and is not for sale! The "Wobbler" - it's a topiary form but only the English would have a clever name for it! I adore topiaries and have had my globe ivy topiary since the first Valentine's Lunch I did several years ago. I've had many myrtle topiaries -- all for short periods of time. Very short periods of time! I bought another one in April and it's growing! I think I found the secret! The "Wobbler" . . . Transforming a plain "topiary" into an English "wobbler"
was bought for this pot of ivy. I had an iron form for it to grow up and around but thought, perhaps that this new topiary would be more fun! So I switched out the topiary form for the "wobbler". We'll keep you advised of it's progress as it grows up and around! It was brilliant of me, I think . . . and it looks smashing! 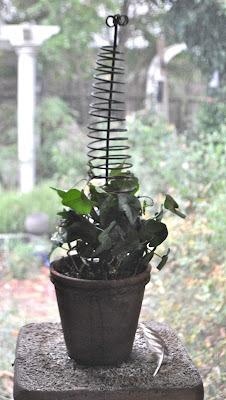 As the ivy grows, I shall tuck it in and around the spirals of the wobbler. And this evening, we headed to Liberty Theatre. 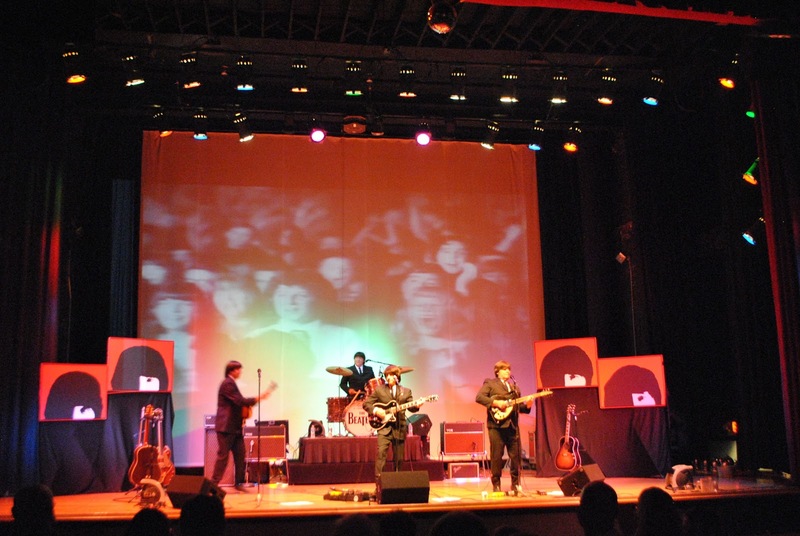 A great event theatre here in our little town. For a favorite group was playing . . . In our opinion, the BEST Beatles Tribute Band in the Country!!! They first played here and at the Liberty ten years ago -- for we brought them here for our Daughter's wedding. And first Michael and now Jim bring them back to our town . . . and they are a favorite. It was a packed house tonight. The band brings back memories -- many memories -- of youth and The Beatles as well as our daughter's wedding 10 years ago. "John" told me that Liverpool had been playing for 23 years . 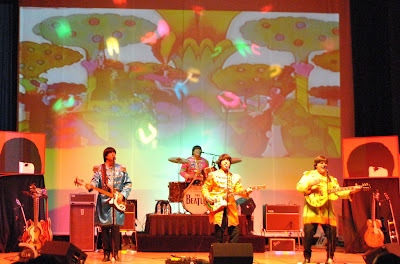 . . and at the time they started there were only 5 Beatle Tribute Bands total in the United States -- now there are 500! He also said that in all probability that tonight there was a Beatle Tribute Band playing in every state in the United States. It's always nice to see the guys again and they're concert is absolutely the best! We had a grand time even though it was a late night! We can't wait until they come back! I'm joining Bernideen for Open House. I'd love to share my "wobbler"! Two for Tea? Twelve for Tea! As a lover of Downton Abbey, when friend Cynthia asked me if I would do a tea class at her shop, life+style, of course, I said "yes"!!! 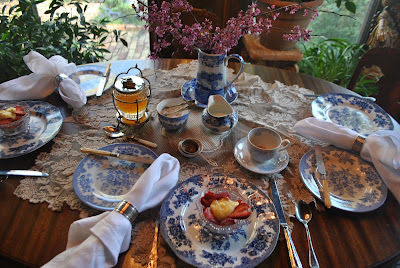 We'd play off the Downton Abbey, we decided and do a real English tea. And I wouldn't be teaching the class, but my alter ego, Mrs. Simkins. An American married to a Brit who worked for Lord and Lady Crowdly at Downtown Abbey. With a long black skirt and blouse and a white pinafore apron and a little lace on my head, I was transformed into "Mrs. Simkins". And for the class . . .
No mugs here -- but rather cups and saucers. Do you recognize Linderhof's beloved blue and white? 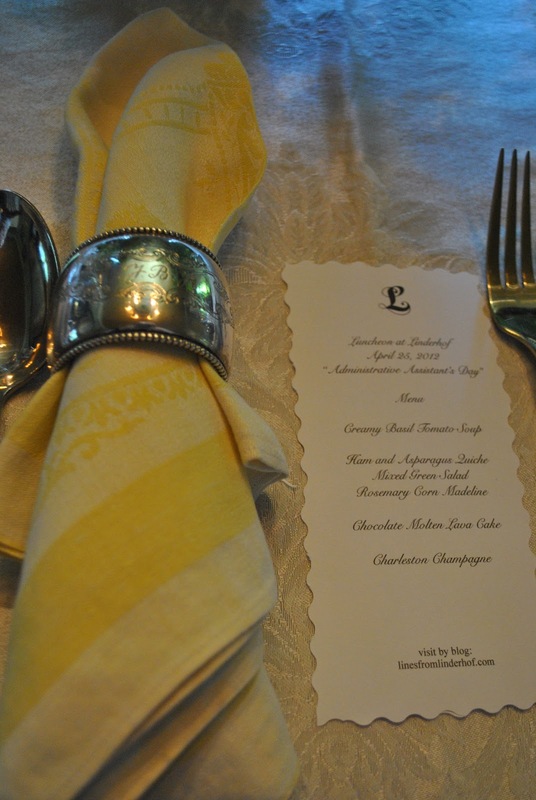 Real napkins, a teaspoon and a pastry fork and a menu of the tea foods to be served this evening. A proper tea has a proper order . . .
First, sandwiches. 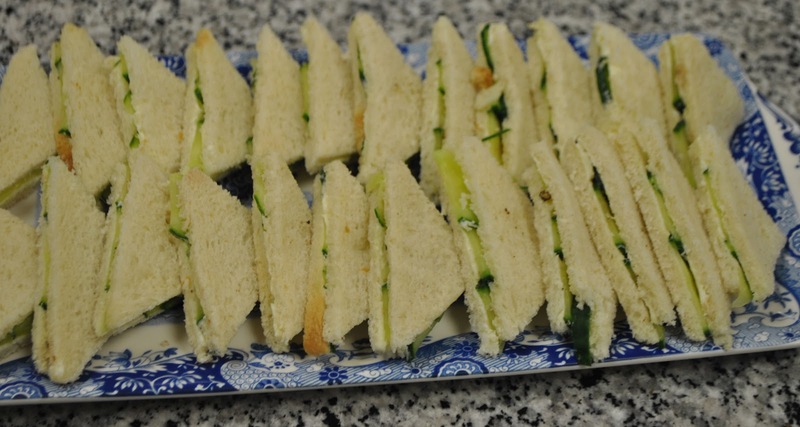 Traditional cucumber sandwiches. Cucumbers thinly sliced and put in a colander with salt between layers and left to drain for about 15 minutes or so. Then they're dried and thinly sliced bread is buttered. The cucumbers put on top and salt and peppered (lightly salted), then a second slice of bread is buttered and put on top. The sandwiches are then trimmed of crusts and sliced into triangles. Next scones. Traditional scones, cut into rounds. 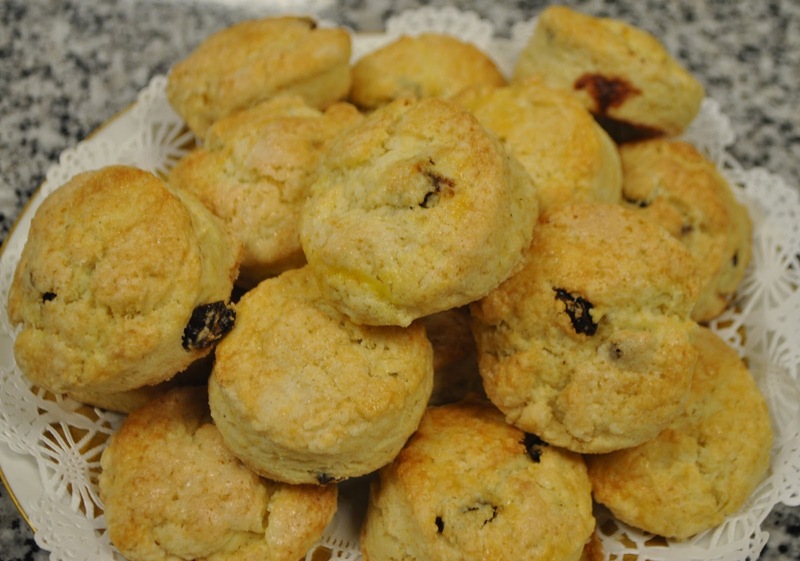 Fruit scones. Which means either currants or raisins. Ours had raisins. Not too big for it is tea time but not tiny either for it is tea time! Combine flour, sugar, baking powder and salt in the bowl of an electric mixer. Blend in the cold butter until it is the size of peas. Mix eggs and cream together. Add to dry mixture. Combine the raisins with 1 T. flour. Add to dough. Pat out about 3/4 to 1 inch thick. For real English scones, cut into rounds. For American scones, cut into squares and then into triangles. Place on baking sheet lined with parchment paper or silpat. Brush the scones with the egg wash and sprinkle with sugar. Bake for 20 to 25 inutes until the outsides are crisp and the insides are done. 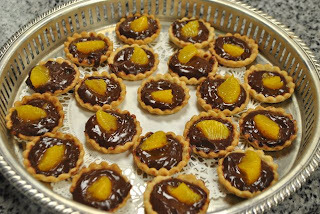 And then the sweets . . . .
Preheat oven to 350. Grease a loaf pan. Line the bottom with parchment. Grease and flour the pan. Sift together the flour, baking powder and salt into 1 bowl. In another bowl, whisk together the yogurt, 1 cup sugar, the eggs, lemon zest and vanilla. Slowly whisk the dry ingredients into the wet ingredients. With a rubber spatula, fold the vegetable oil into the batter, making sure it's all incorporated. Pour the batter into the prepared pan and bake for about 50 minutes or until a cake tester placed in the center of the loaf comes out clean. Meanwhile, cook the 1/3 c. lemon juice and the remaining 1/3 cup sugar in a small pan until the sugar dissolves and the mixture is clear. Set aside. 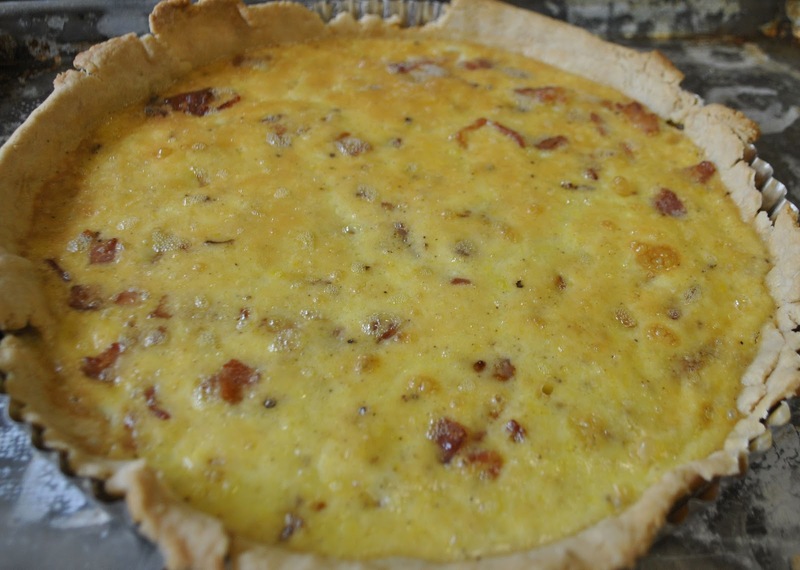 Make your favorite recipe tart shell (or use refrigerated crusts). 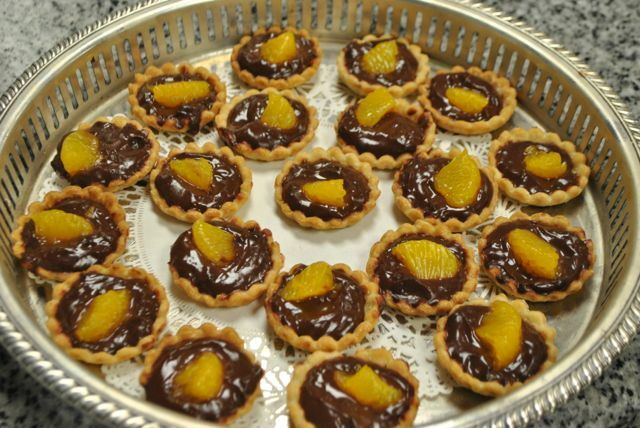 If you have a tartlet pan, put the crusts into that. If not, you can tamp them down into mini muffin tins. Use a small box of instant chocolate pudding. Add 1/4 c. Grand Marnier to a measuring cup and then add milk to make 2 cups. Pour into chocolate pudding and stir until it starts to thicken. You can also add the grated zest of 1 orange before you add the liquid. Let pudding mixture set until it's solid and then put it in the pre baked tart shells. Top with a bit of an orange, if desired. Preheat oven to 350. 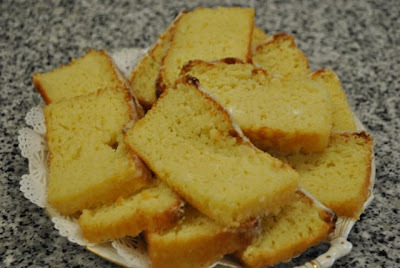 Butter 2 cake tins and line the base of each with baking parchment. Put the walnut pieces in a food processor and blitz to a fine nutty powder. Add the buyer, flour 4 t. espresso powder, baking powder, baking soda and eggs and process to a smooth batter. Add the milk, pouring it down the funnel with the motor running, or just pulsing, to loosen the cake mixture. If should be soft, dropping consistency, so add more milk, if needed. Divide the mixture between the two tins and bake it in the oven for 25 minutes or until a skewer comes out clean. Cool in the tins for a few minutes before turning out onto a rack. When the sponges are cool, make the buttercream. Pulse the icing sugar in the food processor to remove any lumps and then add the butter and process to make a smooth icing. Dissolve the instant espresso powder in 1 T. of boiling water and add it while still hot to the processor, pulsing to blend into the buttercream. Turn one cake over and decorate with cream. Top with second layer. 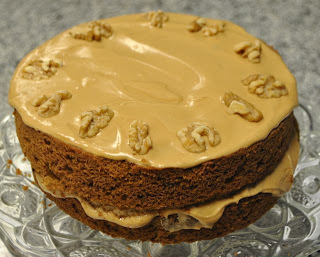 Cover the top of the cake with the rest of the icing and gently press the walnut halves into the top of the icing all around the edges to make a pretty pattern. Note: The Brits only frost their cakes between layers and on top -- not on the sides. 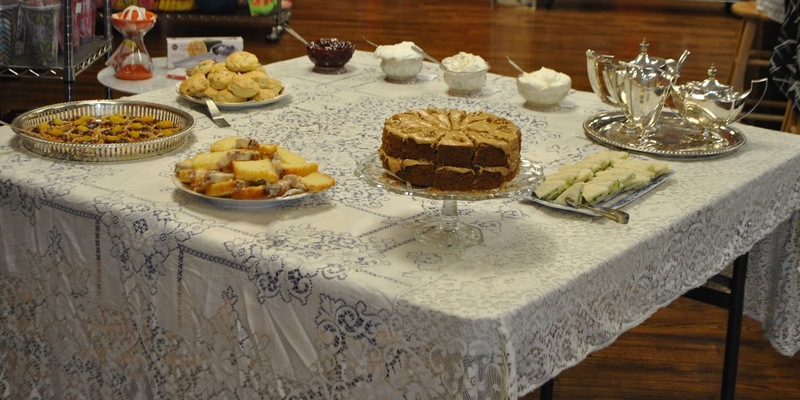 The tea table, laden with food and 3 kinds of Devonshire Cream for the scones -- or actually, whatever else you want to put it on! Hats and gloves were "optional" but most guests wore them. The guests came complete with hats and gloves! I love pictures of the "after" table! 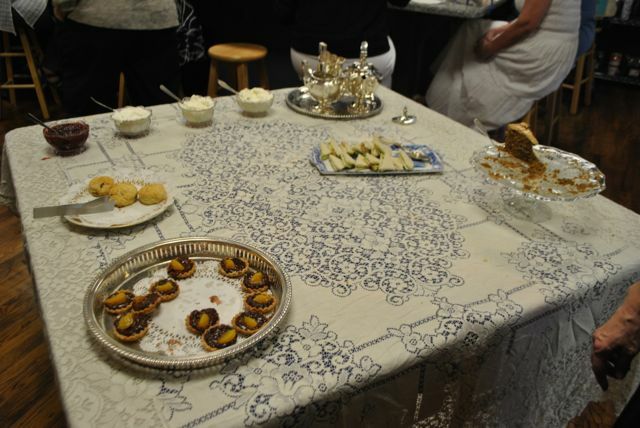 And they ate -- three scones left, a few sandwiches and tarts. We refilled the tray once and this was what was left of the second tray! A good time was had by all. Mrs. Simkins was a big hit and she may return. She is available for private classes. Just call Cynthia at life+style to arrange. 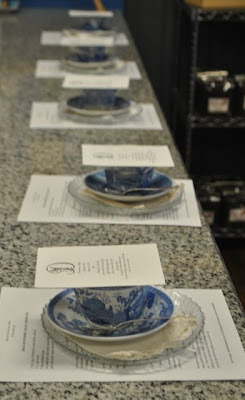 Mrs. "S" would be glad to cross the pond to share more of her knowledge of tea! And tea treats! We're anxiously awaiting Downton Abbey but alas, I guess it will be January before it will air. I'm told that this fall it will be on BBC in England. It is, perhaps, a reason to go back, don't you think? 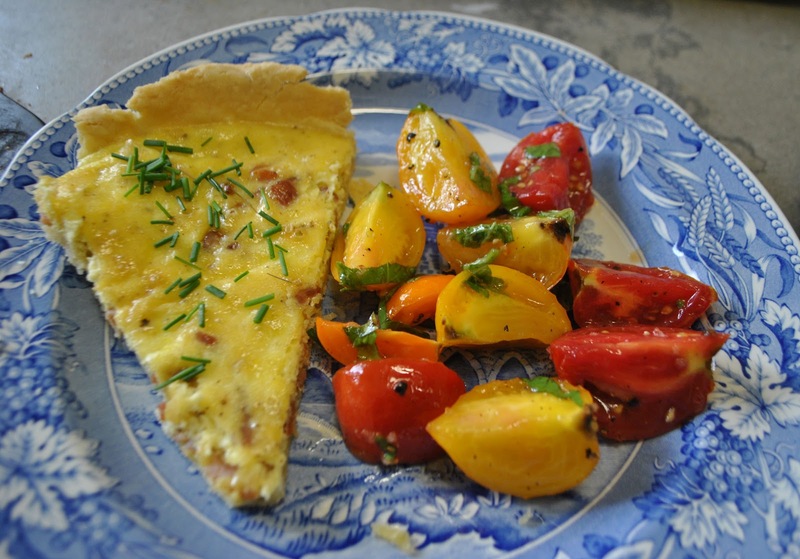 It's Friday and I'm joining Michael at Designs by Gollum for Foodie Friday. Every year that I'm Guest Chef at the Farmer's Market, I always give away a luncheon. I love having company and what better way to showcase Farmer's Market produce than at a luncheon! 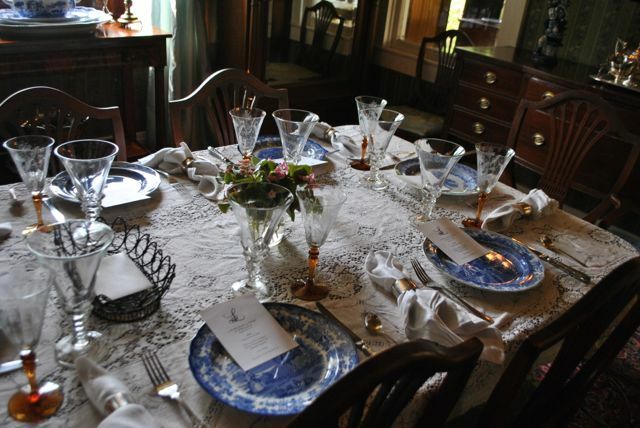 The table in the dining room all set for company. 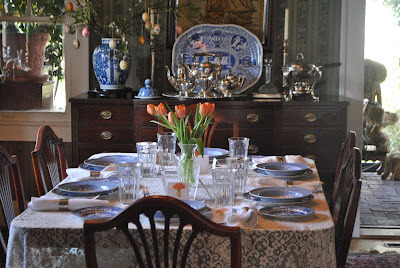 The table set for four in the dining room -- because of the devastation in the garden -- it's not "pretty" out there anymore! Blue and white, of course! 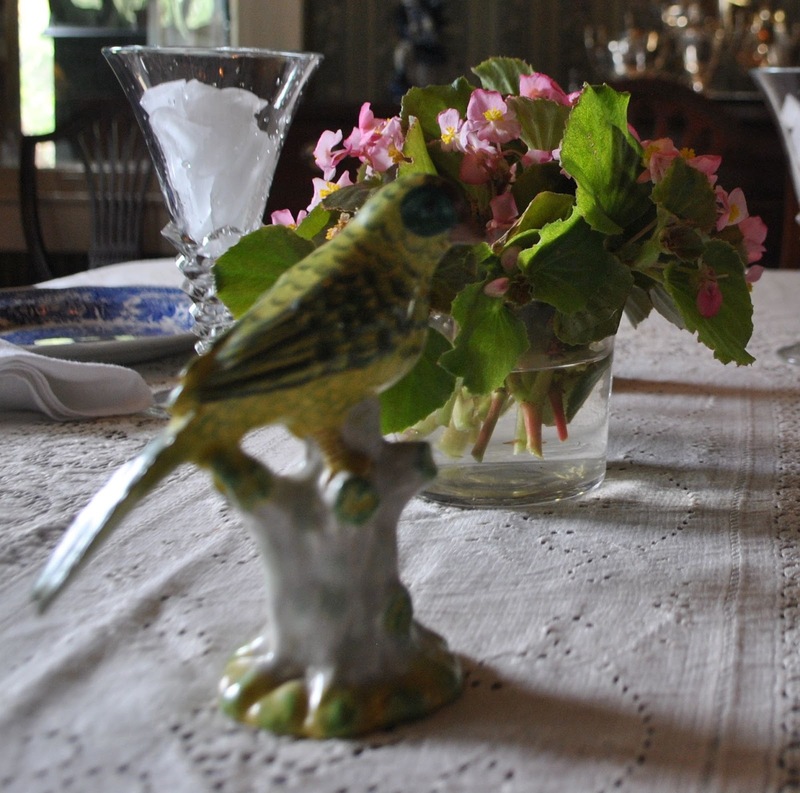 Birds and flowers are perfect for a company luncheon. Blue and white always set a perfect table. 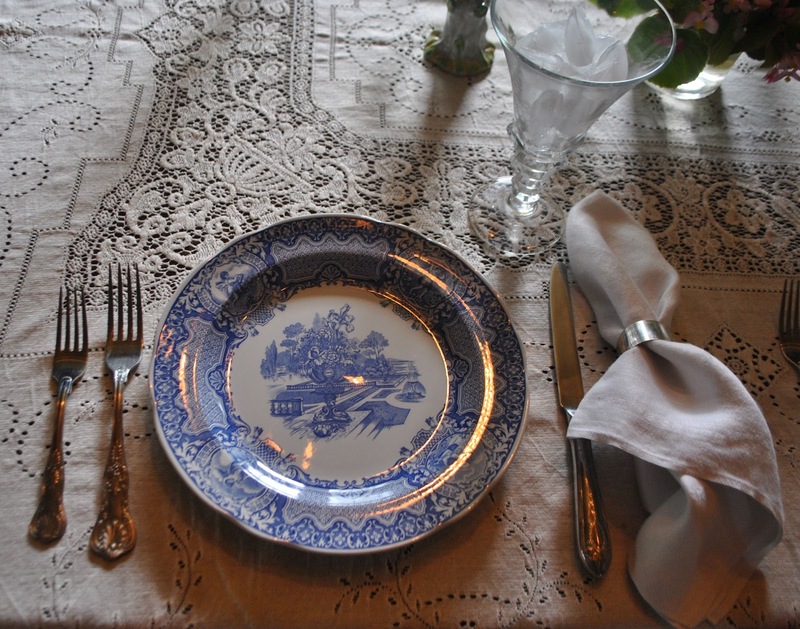 Spode Blue Room plates, my usual water glasses and the hotel cutlery. 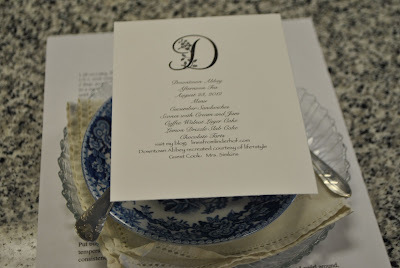 A lace tablecloth on the table and an Irish linen napkin in a silver napkin ring. I adore these birds and add them to my luncheon tables often. I make sure that each bird faces a different direction so no one has to only see "bird bottoms"! 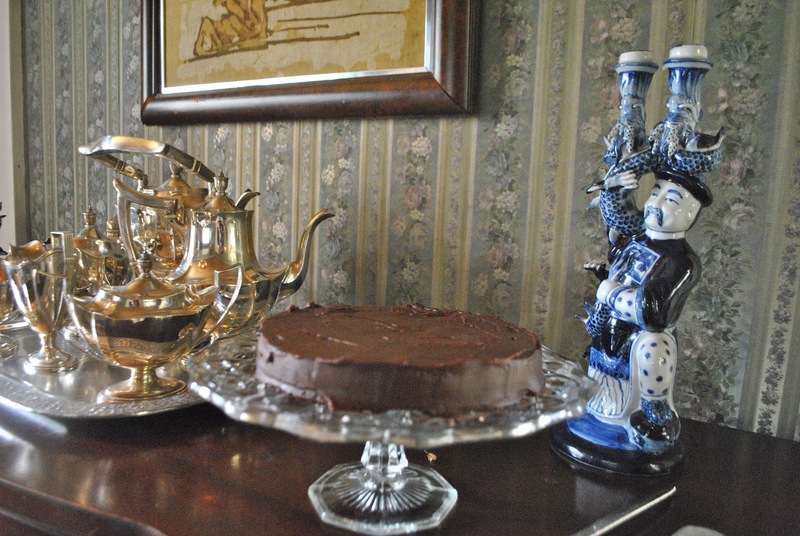 The sideboard is always the perfect place for a cake on a pedestal. 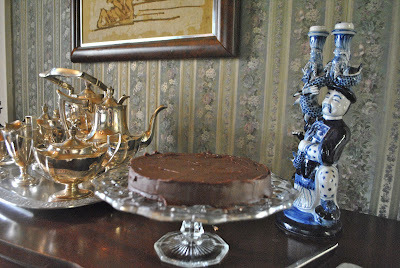 On the sideboard, Julia's chocolate almond cake. All ready for dessert! The lunch . . . Served with small Farmer's Market tomatoes quartered (yellow, red and orange ones) with a splash of olive oil and a big shower of basil. We started with a salad of mixed baby greens with blueberries, pine nuts and goat cheese dressed with a vinaigrette. Dessert was a big helping of chocolate cake. A delicious way to end a meal! Preheat the oven to 400. Put the piecrust in a 10 inch quiche dish (or pie pan if you don't have a quiche dish) Prick with a fork in a few places and line with foil (shiny side down). Fill with beans or pie weights. Bake for 10 minutes to set the crust. Remove foil and beans and bake 5 minutes more to set crust. Cool. Meanwhile, gently fry the bacon in the butter until brown and crisp. Cool. Mix the cream, eggs and nutmeg together. Add the bacon, salt and pepper. Tip the mixture into the prepared crust. Turn down the oven to 300 and bake for 25 to 30 minutes until the custard is lightly set and the crust is golden brown. Serve warm or at room temperature -- never chilled. It's Thursday and I'm joining Susan at Between Naps on the Porch for Tablescape Thursday. Chicago, Chicago, that toddling town . . .
A Happy Solution . . . When Is a Flower Vase Not a Flower Vase? An Excuse For A Party! A Little Bit of Paint . . .